Volunteers at a Charity's Chesterfield HQ took part in a six hour fundraiser today. St John's Ambulance members in the town held a sponsored resuscitation event to raise cash for the branch. First aiders worked in five minute CPR and mouth to mouth relays to deliver continuous resuscitation to the "Resusci Anne" dolls used in training. We're all familiar with the St John's service - wherever there’s a gathering of people - football matches, carnivals, festivals, they're on hand to provide first aid and care. However, what's less well known is that they're not publicly funded and rely on donations and events like this to make sure they can continue their work. Wendy Rushby, senior training volunteer, told the Chesterfield Post just how difficult it's been for the charity during the recession, "We've suffered greatly, obviously there are disasters out there all the time and long standing charities suffer." They'd like more volunteers too! Anyone can join, they'll receive training and it's a real family centred service, with children able to attend as Badgers or Cadets. 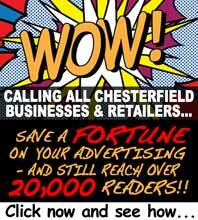 There's 40 divisions in Chesterfield alone, so anyone signing up would never be far from home either. Money raised from the event today will go into the training budget and will help to continue to fund high quality teaching of skills which could one day save your life. Gareth Yeardley who's an adult volunteer says he loves doing it, it's great fun and a good way to meet people providing valuable experience and skills needed for a working environment. He particularly enjoys covering the sporting events, notably Queen's Park Leisure Centre's Karate tournaments and Chesterfield Town Football Club. If you'd like to become a volunteer, please contact Wendy on Chesterfield 200272.